New Delhi : The apex consumer court on Monday served a notice on Nestle India over the government’s Rs.640-crore unfair trade practice class action suit related to Maggi noodles and fixed Sep 30 as the next date of hearing. A bench of the National Consumer Disputes Redressal Commission, comprising Justice V.K. Jain and Justice B.C. Gupta, directed Nestle to respond to the notice by Sep 30 and allowed the government to send samples of Maggi noodles to an accredited laboratory for tests on lead content and MSG. “The court has accepted to hear the case for unfair trade practice and misleading consumers through advertisements and packaging,” Additional Solicitor General Sanjay Jain said after the preliminary hearing. During the hearing, the bench expressed doubt over the government’s cause of action, saying the Bombay High Court’s judgment in the matter had dealt with the issue of lead content. It said since the high court had rejected the government’s current reports on lead content — for not being from an accredited laboratory — there was no report to prove the government’s contention that Nestle was selling hazardous products. The government’s counsel, Sanjay Jain, replied that the government had approached the consumer forum on a “broader issue”. The central government was dealing with the question of whether Nestle had “all this while” sold a product which did not meet India’s food safety standards, he said. After a 30-minute hearing, the forum agreed to have Maggi samples tested at an accredited lab, and issued the notice to Nestle to respond to the government’s accusations. The Department of Consumer Affairs had alleged that Nestle by its “unfair trade practices” vis a vis Maggi instant noodles, by selling “defective and hazardous products” has caused injury to millions of consumers, which called for this class action suit. “It is now apparent that Maggi and its variants are neither healthy nor enjoyable. Quite the contrary, they are far from the quality and standard what even the opponent company had claimed them to be, while seeking approval,” the government had said in its petition. Last week, Nestle India had got a significant respite with the Bombay High Court lifting the ban on the sale of nine instant noodle brands and ordering fresh tests in three separate labs to ascertain that the products complied with the country’s food safety norms. 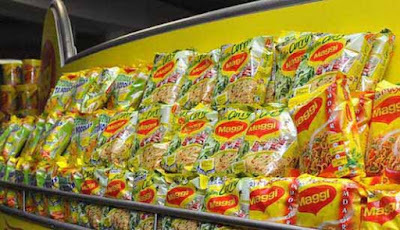 The conditional relief came following a petition filed by Nestle challenging the regulatory order of June 5 for the withdrawal and recall of nine variants of “Maggi Instant Noodles” and “Maggi Oats Masala Noodles with Tastemaker”. The Food Safety and Standards Authority of India (FSSAI), the industry watchdog, had said in its ban order of June 5 that tests conducted on a batch of Maggi were found to contain more-than-permissible levels of lead and high quantities of mono-sodium glutamate (MSG).